We had an excellent day with Clemente. He is knowledgeable, personable, and professional. He has a genuine passion for his country, its history, and its culture, and he enjoys sharing his knowledge with his clients. We would highly recommend Clemente to anyone who is interested in learning about the Panama Canal, Panamanian history, or Panamanian culture. Clemente was a wonderful guide! He drove us around both the city and surrounding area, stopped at multiple sites and shared his love for his country and its fascinating history. We went off the beaten track a little and saw some areas that few tourists go which was excellent. A really wonderful guide and tour. TOUR GUIDE RESPONSE: I am so happy to know you enjoy the tour and my company, I felt a great honor to be with you and your wife (C), I love meeting people, becoming a on oficial embassador of my country, I put my heart in what I do and when I get feed back like yours, it encourge me to continue, doing my best, to make five stars tours for all the people I meet, many thanks R&C,. my best wishes to you, I hope to continue meeting people as, lovely as you. Tour itself was informative, tour guide was ok.
We had a wonderful day with Clemente touring all around Panama City. We learned so much from him about the canal, the people of Panama, the history, the role of the French and Americans. Clemente is very knowledgeable and thoroughly enjoys sharing his knowledge and passion. He speaks English fluently and is easy to understand. He wanted to know about what interested us and tailored our time with him. I would recommend Clemente for a wonderful informative visit to Panama City. Clemente was informative but somewhat distracted and seemed bored with his job. Took us to crowded venues we wished to avoid. Walked us through Panama City for hours. Suggested a cafeteria restaurant for food that was very low end. We bought him and his driver lunch without so much as a thank you. His driver appeared put out with his job and was distracted while driving us, resulting in two instances of slamming on his brakes and narrowly avoiding us crashing into cars ahead of us and behind us. TOUR GUIDE RESPONSE: January 26 Pope Francisco and more than 750.000.00 pilgrims was visiting Panama city, the Panama Canal Visitors Center at Miraflores Locks was crowded, we whent away and return, it was the same. To get in and out of Old Town whe had to walk. Many roads where closed, traffic was more bad than usual. But we visit all the places on the tour description. Before coming to Panama you knew this. No way I could avoid the crowds and walking you mention, and visit all the places you wanted, I deeply apologice. Clemente is a wonderfully funny, knowledgeable, and accommodating tour guide. He was able to address all my questions and ensured that the private tour I had requested would be possible. He was also very adept at modifying our itinerary as my plans changed in the moment. Clemente was very warm, welcoming, and kind. He showed great knowledge of Panamanian culture, history, and economics. I look forward to another tour with Clemente next time I visit Panama. Our guide, Clemente, was great. He has over twenty years experience and is very knowledgeable about the history of Panama. We were provided an excellent overview of the city and surrounding area. Clemente provided us the opportunity to visit the nearby forest and see the trail where Captain Morgan traveled through the forest to sack Panama City. He was able to answer all of our questions. This excursion was most definitely better than the usual cruise boat tour and we would highly recommend it. TOUR GUIDE RESPONSE: I enjoy a lot been in your company and Sue, It was a pleasure. Clemente was an Outstanding Guide - So Professional and Informative. I would highly recommend Clemente's guide services to anyone. We toured Panama City, the canal, Colon and a nice Carribean seaside cafe for lunch. I travel and use Tours by Locals frequently - I was most impressed by him, his knowledge and ability to share with us. He also did an amazing job of customizing the tour to our needs. Outstanding and Thank You!! TOUR GUIDE RESPONSE: For me It was a honor and a pleasure to be at your service. Many thanks. Clemente did a good job of showing us the highlights of Panama City. I especially liked the ruins of the old city and its history. Our ship is docked at Colon so it was a good hour or so drive. Still a very worthwhile day. Clemente was not rushed and did a good job of showing all sides of the city even the local side. I would highly recommend him. Clemente was awesome. He is very informative and he showed us about everything there was to be seen and had us back at the ship in plenty of time. He redid our tour to accomadate seeing Larry's old fort and places he knew when stationed at Fort Davis. We even got to walk across the canal. Thank you for a wonderful day! TOUR GUIDE RESPONSE: Carole...it was a pleasure. Clemente was a joy to be with. His local knowledge is fantastic and he really seemed to enjoy sharing it with us. This was a very educational tour. You can tell Clemente takes great pride in his job. He is very knowledgeable about Panamanian history. He shared with us many places that no tour bus goes. We got out of the vehicle several times to see, hear and most importantly feel the history. Standing on the very ground and pathways where important historic events took place. I would recommend Clemente over and over again. TOUR GUIDE RESPONSE: Many thanks, my reward is knowing that you enjoy and value my effort to make sure you got the best, I had a excellent day in your company, it was a pleasure and a honor. Hope to see you again. Excellent tour and guide. I had a relatively short stay in Panama and Clemente was very flexible throughout the entire time, making sure that I got to see (only) what I wanted. He is very experienced and can easily adjust the conversation/information about Panamanian history, economy, and politics to all levels. While driving through the forest, he stopped several times and pointed out monkeys and sloths that I would have never noticed on my own. The tour and guide were absolutely worth every penny. TOUR GUIDE RESPONSE: Many thanks Álex, just as I told you its not abouth the money my best reward is knowing that you enjoy, to meet your expectations and beyond. My David Copperfield (my wife) already dissapear the money you pay me, but earing from you, make me feel super fantastic, hasta pronto amigo. Clemente was an absolutely wonderful tour guide. I plan to use his services next time I am in Panama. He was not only very knowledgeable but very friendly and provided an excellent tour of Panama City. I had limited time and he made the most of it. Can't recommend him highly enough! TOUR GUIDE RESPONSE: I really enjoy taking you and your husband Mathew, to know our city and Canal, just as I told you, my reward is knowing that you enjoy and value my effort to make your stay in Panama, the best...many thanks, I am at your orders any time. Gracias. Clemente was our guide for five days and was good every time. He was especially knowledgeable about the local history, was sensitive and inclusive to all ethnicities and religions, making for an all inclusive, interesting and fun trip. We would definitely use him again if we visit Panama in the future. The guide for our one day tour of the Canal and Panama City couldn't have been better! Clemente didn't just show us sights, he made us feel like we had seen and experienced Panama! He began by telling us where we would go and what we would see and then proceeded to take us along on an adventure to discover this country. TOUR GUIDE RESPONSE: The money that you pay for your is not the most important for me, the most important is knowing that you value all that I do to make your stay in my Country, the best. From my heart I enjoy every moment I spent in your company, many thanks. Clemente was a very good tour guide. He was knowledgeable and friendly. He made sure we had a good day. We learned a lot about Panama, historically and what is going on today. We went to many areas of the city as well as the locks. Really got a great overview of Panama. We only had the one day before the cruise so this tour really put it together for us. Clemente was patient and helpful with my request to see potential expat neighborhoods. Unfortunately we didn't get to ride the metro but did visit the large northern bus station & mall. The food court will make you feel in Fast Food Land. Clemente's van is a bit rough, but we got around safely. Thanks Clemente, I enjoyed your help. TOUR GUIDE RESPONSE: For me It was a pleasure and a honor, I really enjoy your company. Just finished my tour with Clemente. He is fabulous. So knowledgeable and personable. Took me all over the city. Gave me so much great info on history. I love to learn as well as see the sights and he provided me with both goals. He is a true asset to your organization. I would highly recommend him to any traveler. Very personable and knowledgeable. We would recommend him. Absolutely excellent. Clemente was extremely friendly and very knowledgeable. TOUR GUIDE RESPONSE: I love every moment I spent in your family company. For me It was not work, It was a great time in company of very nice people. This was the best tour ever!!!! Clemente was informative, personable, and very nice. He gave us the tour we wanted in panama. Clemente is an excellent guide. He is knowledgeable about the History of Panama and showed us as much as we could see in a day from the Atlantic Coast to the Pacific Coast. Panama City was fascinating. We recommend him as a Superb Guide. Thank you Clemente was a wonderful day. TOUR GUIDE RESPONSE: Thank you Judy, It was a wonderfull Christmas eve in your company, thank you for making me part of your vacation. Clemente was well informed and good at sharing his knowledge. He was knowledgable and gave so much information we should of taken notes. He will tailor the tour to your requests. He picked us up in a passenger van that he kept running so it would remain cool and comfortable. It was designed for maybe 10-12 people so with only three of us it was bumpy, but after I sat in the front seat I was more comfortable. We felt we experience enough of Panama City area and went through the museum at the canal/locks. TOUR GUIDE RESPONSE: My biggest reward is to know that my efforth to your stay in Panama, a very,very nice one, and at the end your leave with a clear knoledge and understanding of Panama and its people. You are welcome any time. One of the best tours we've taken. Learned a lot, covered a lot of ground and had a great day! We'd highly recommend our new friend Clemente to serve as your guide in Panama! Clemente was very professional tour guide which we thought highly of and would rehire. He was in the hotel lobby to meet us on time at 8:30 AM and dressed in polo shirt and creased pants (my wife noticed). He drove the four of us in 7-10 person van (so there was lots of room) on the Panama City Tour. He had boom mike into van audio system so everyone could hear his inciteful commentary during the day. Good driving skills (traffic is a little crazy here but never felt uncomfortable). TOUR GUIDE RESPONSE: I appreciate very much your suggestions, I will do so. We had a wonderful tour given by Clemente. He was extremely knowledgeable of Panama City and the rest of the surrounding area. His personal insight and first-hand accounts of day to day operations of the Canal were fascinating. He showed us areas of the city we would not have found on our own. Clemente was always mindful of our safety, and his driving and parking skills were excellent. He listened to our interests and tailored the tour to our time schedule and allowed us to set the pace at each stop. TOUR GUIDE RESPONSE: Thank you both...Jajaja ...Yes she was very happy...I had a great day in your company, knowing that you really enjoy your tour and you appreciate my effort is the best reward. Many thanks from My David Copperfield (my wife) and my kinds. Hope to meet you another time. I also Hope you had a Wonderfull birthday!!! Disappointing start, had to wait as Clemente thought it was 9:00 start not 8:30. Once he arrived vehicle quality was poor, wet seat & seat belts. No microphone so couldn't hear in back. Clemente was very knowledgeable, the tour gave good insight into Panama, the highlight was the view from Ancon hill. So much more to see than initial sights around Colon port. Driving in Panama was hair raising, we were glad to have survived & be back at ship. Clemente listened to what we were interested in and delivered. Well done. TOUR GUIDE RESPONSE: Many thanks Zak, I will. I spent a wonderfull day, touring Panama city with your family, many, many, thanks for a great day. Our group enjoyed Clemente's comprehensive tour of Panama. He was super enthusiastic about his City and it showed during our 6 hours of touring. I recommend him to other groups. Clemente could not have been a better local guide. He was enthusiastic and welcoming. Took us to the Canal and explained a lot to us there. Then toured around and about panama city. A great day. Highly recommend. TOUR GUIDE RESPONSE: Time spent in your Company was a real pleasure and honor, many thanks. Had a pleasure to have Clemente as a guide during my stay in Panama. He did excellent job! everything was on time, the entire trip was on a high level, the transportation itself was also great! Definitely, can recommend Clemente for other tourists! Thank you for your job! Clemente is great. He has worked various functions at the canal so he is very knowledgeable. He is clear in his delivery of information in both Spanish and English for our group of 8. We would highly recommend his for other tourists visiting the canal zone. Clemente was an awesome guide. We had a great day exploring the locks, learning about the area and a terrific lunch at a really nice restaurant on the water. TOUR GUIDE RESPONSE: For me, It was an honor and a pleasure, I am at your orders any time. I would rate our tour a 5 Clemente was great. Very personable. Communicated with us well. We saw stuff I don't think others on our ship got to see—for instance climbing that hill with the great view of Panama. I also loved Old Town, but by then we were tired and didn't take advantage of it as much as we should have. Next time, I would go there after the viewing of the Panama Canal, have lunch, then do walk….. But I have zero complaints, and only compliments for this tour. Clemente is very worried about details. He make us understand the history of Panama. We visited important places like cross way and the canal. Sorry for my writings. English is not my mother language. TOUR GUIDE RESPONSE: It was a pleasure and a honor to be at your family service. Many thanks for a great day. Clement was very knowledgeable and flexible, and put in a lot of effort during the day. His English was excellent. Fantastic attitude. Great time. Highly recommended. TOUR GUIDE RESPONSE: Gracias Susan! This was our first time in Panama and our first Tours by Locals experience. Clemente gave us a great introduction to the city including a thorough visit at the Miraflores locks on the Canal. We received a good overview of the country's history and a personal view of recent history through the eyes of someone who lived it. Clemente was welcoming and personable and obviously eager to share his city with newcomers. TOUR GUIDE RESPONSE: It was and honor and a pleasure. Many thanks. Our long layover in PANAMA City on our flight to Manaus was well worth it. Clemente used our time to the maximum. He was a knowledgeable guide and sensitive to our wishes. Very pleasing personality, prompt and professional. Good job ! TOUR GUIDE RESPONSE: Many thanks, it was my pleasure, at your orders any time. Gracias! You could not have a friendlier, helpful, informative and proud Panamanian show you around Panama City. Our day with Clement was an absolute pleasure and we would not have changed a thing. If we are back in Panama, we will definitely take other tours that he offers. Thanks again for making the start of our trip so good. TOUR GUIDE RESPONSE: It was and honor and a pleasure to be your personal tour guide for your stsy in Panama. Clemente was prompt, professional, attentive, and knowledgeable. He designed a tour that provides a great overview of Panama City with an in depth look at the Panama Canal. He is also a very nice man. Clemente is the best tour guide I've ever had the pleasure of touring with. His knowledge of the country is astonishing to say the least. His endearing personality created a happy atmosphere for all ten of us. He was so flexible and wanted to please us. He went way above and beyond to ensure that we had the best tour possible. My daughter is going to Panama in a few months and will definitely use Clemente. I can't say enough about the terrific job he did. Thank you Clemente and Tours by Locals! TOUR GUIDE RESPONSE: Your Family made me feel like a other member of the family, I told youmy best reward is knowing that you had a good time. My David Cooperfield (my wife), disappeared my pay as I give it to her, but the memory of the great day I had in you family company, will never disappear. Muchas Gracias! Clemente was great! He's very knowledgeable about the history and the workings of the Panama Canal. He was VERY accommodating of our group that came in on 3 different flights and some had mobility issues. We were running late but he made sure we got into the Miraflores locks and museum before they closed and gave us the highlights of the museum. Don't hesitate to book with Clemente; You'll be happy you did! Our party of 8 were met by Clemente at time pre arranged in Colon, Panama. Clemente exceeded our expectations as a tour guide. He was so knowledgeable of the tour we were on. Clemente provided so much information, history etc and answered any questions that we had. He also transported us in a very comfortable vehicle, made for larger parties. I would recommend his tour of Panama to anyone interested. Clemente is a very kind, caring person as well. People like Clemente make your day so memorable. TOUR GUIDE RESPONSE: I was more than happy to be at your service. Knowing that you had a good time is the best pay for me. Many thanks. Clemente was my guide on a combined Canal and City tour. He is a very experienced and knowledgeable guide. He loves his job. Clemente schedules the tour wisely and makes it an exciting day for his clients. I've got a great introduction to Panama's history and culture. He is also a very friendly and nice person. I would highly recommend him. TOUR GUIDE RESPONSE: It was for my a honor and a pleassure to be at your orders. Many thanks. What a terrific time! Our guides were charming, informative and a lot of fun, and the food was amazing. The only warning -- come hungry. I've been on a number of food walking tours and none have come close in terms of the quantity of food served. We realized after the first stop that we'd better pace ourselves or we wouldn't survive the last one. We had a great day with Clemente, he is very knowledgeable and friendly. TOUR GUIDE RESPONSE: Many thanks it was an honor. Clemente does a wonderful job, particularly with tailoring the tour to your group's needs. We bring a university group each year to Panama of 15-20 people and he does a great job with the Canal and City Tour. I would highly recommend! TOUR GUIDE RESPONSE: It's a pleasure and a honor, I enjoy every moment of our tour. The best guide we have ever had (10 plus cruises). He kept all enthralled with the history and information about Panama. We were children, teens, adults, and senors. He was voted awesome. TOUR GUIDE RESPONSE: It was an honor, Just as I told you, my compensation is to know that you had a great tour with me as your Private guide. Gracias! Great guide, very comprehensive tour. TOUR GUIDE RESPONSE: Many thanls. Clemente is personable, professional, and has extensive knowledge of the history, buildings, and areas we toured. He speaks excellent English. We feel very fortunate to have had him as our tour guide. We recommend him without reservation should you be touring Panama City. TOUR GUIDE RESPONSE: It was an honor and a pleasure. TOUR GUIDE RESPONSE: A la orden siempre Jorge. If you are going to Panama - - YOU MUST MEET CLEMENTE! We researched different tour companies, including those referred by our hotel. The positive reviews of Clemente "sold" us. This guy is AWESOME. In 6 hours he will make you love Panama, and show you the amazing wealth of culture that makes the city and country so unique. The canal, the rain forest, the entire city, we saw it all. He's a walking history book and so personable. A fantastic tour with a truly spectacular guide, HIGHLIGHT OF OUR TRIP! TOUR GUIDE RESPONSE: Jajaja thanks... thanks, a million thanks, it was very nice to meet you, I enjoy every minute of your company, that you enjoy the tour, that I met all your expectations, that you had a wonderfull day, that is really my compensation. It was an honor and a pleasure to be at your service. Clemente was an excellent tour guide and personalized our tour as needed. My family, 2 adults and 3 children, learned many things from him. It was nice to get a native's point of view. We would recommend Clemente to anyone. TOUR GUIDE RESPONSE: It was a pleasure and a honor to be with your family as your private guide. Clemente was a wonderful guide: friendly, lively,great sense of humor, and very informed presenting historical and current information in a very interesting and helpful way. We had a great day seeing Panama City; we had a great day with Clemente. There were four of us touring with Clemente for more than 6 hours. We all highly recommend Clemente. Great guy. TOUR GUIDE RESPONSE: It was my pleasure, at your orders any time. TOUR GUIDE RESPONSE: It was a honor to be your private guide. Best day from 3 week trip due to Clemente. Always felt secure. Our group of 7 all agree tour covered old and new from coast to coast. Would give 10 stars. TOUR GUIDE RESPONSE: A million thanks! It was my honor and pleasure, remenber the panamanian David Cooperfield (my wife). Best regards. Clemente is extremely knowledgeable about the Canal, having worked on it for several years. We had been tepid about visiting the Locks area beforehand, but were very glad we did. Now we understand ,uch more. 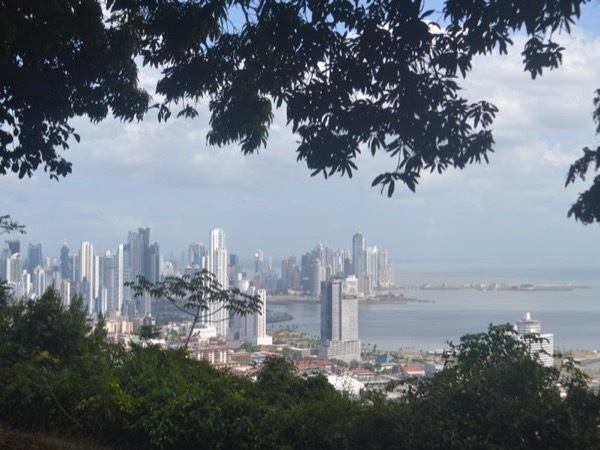 He also took us to the crossroads of the Spanish trail across Panama and the highest point in the city for a spectacular view -- these were both things we would never have thought of doing. At the same time, he made sure we did visit places we asked to see like the Biodiversity Museum. Terrific! TOUR GUIDE RESPONSE: Thanks, it was my honor. This was a great tour and Clemente was an excellent guide. He was well organized, well informed and as important, very personable. We were two families with teenagers and this was a great overview of the city (and information on the country) in a 6 hour tour that he adjusted for us. I would definitely recommend him. TOUR GUIDE RESPONSE: It was my honor. Clemente is the best tour guide I have ever hired in all my travels.. He is a gentleman and very personable. He makes you feel as if you knew him all of your life..
TOUR GUIDE RESPONSE: At your orders. It was an honor to be your guide, specially to be your father guide to Panama, after 70 years that he visit Panama. He told me, that Panama was always in is heart, please let him know that he will always be in my heart. Great tour! Clemente was full of knowledge of the city and took us exactly where we wanted to go! We enjoyed it very much! TOUR GUIDE RESPONSE: I also enjoyed your company, during this full day tour, thanks for the opportunity. TOUR GUIDE RESPONSE: It was an honor and a pleasure to be at your service, thank you for the opportunity. Very pleasant tour, and agreeable guide. Got a great history about Panama! We booked a tour with Clemente for 02/25/2015 to see Panama City and to take the "Grand Canal Tour." His tour was very comprehensive, and it was apparent that he had a thorough knowledge of the area. We had a "taste of Panama" lunch (which he joined at our invitation), and by the end of the day, we felt like we were being treated as he would treat members of his family that came to visit Panama. TOUR GUIDE RESPONSE: For me the best part of the tour is not what you pay, is the opportunity to share my knowledge and experience with you, the satisfaction to see that your expectations where fill, the memory of another good day in my life. Thanks. You are family. Fantastic tour. Well versed on the history of the area, and canal. Had a lot of fun, saw a lot and learned even more. Clemente has a great rapport with the locals, giving us many extra's. TOUR GUIDE RESPONSE: At your orders. Clemete is a terrific personality and a knowledgeable guide He was on time, well-dressed, always polite but with a lively personality that made the day about more than just the sites. He is open and listens. He took into account my preferences and seemed completely cool. Perfect day. TOUR GUIDE RESPONSE: Thanks, my joy is to serve you. Clemente did a fabulous job with our group of 20 university students. Since our students were business students, he also focused a lot of the tour on Panama's economy and the influence the canal plays in the country's finances. Clemente did an excellent job managing our large group. We started with the Panama Canal and we would not have learned nearly as much had we done a self-guided tour of the museum. We then went to the old town and Ancon hill, which were also great! Everything was perfect! Clemente showed up right on time, and let us set the pace of the tour. If we wanted to spend more time at one site, or less time at another we did. Clemente was personable as well as knowledgeable, and was more than willing to answer all our questions. We truly felt as if we were being guided by a friend. I would definitely use tours by locals again and have already recommended them to several others. Thanks so much. TOUR GUIDE RESPONSE: It was an honor to be at your service. For me you are more than a customer,you are family. Good mix of places to visit. Highly recommend Clemente has a tour guide/driver. His knowledge of Panama's historical underpinnings (old town and old city), the building of the canal, modern Panama, and the future locks is unmatched. His is very personable and tailored his tour to meet my travel interests/needs. Good sense of humor and very personable. TOUR GUIDE RESPONSE: It was my honor to be your private guide, thanks a lot for the opportunity. I also appreciate the information you shared with me abount you travel experience, It was a pleasure. Clemente is a wonderful guide. He is very knowledgeable about Panama City, Panama Canal, and most of Panama. He speaks very good English and is very accommodating with our needs and questions. His tour will leave you feeling like you should receive a Historical Certificate of Panama. We thoroughly enjoyed him and his wonderful disposition. He makes Panama a wonderful place to visit not only once but often. He makes you feel like family. Thanks for everything, Clemente. TOUR GUIDE RESPONSE: It was my honor and a pleasure to be at your orders thanks. Clemente was awesome and we would highly recommend him for any tours. His knowledge of the area and of the canal was outstanding. If you want a first class tour of Panama City and the canal choose Clemente and you will not be disappointed. TOUR GUIDE RESPONSE: It was a pleasure and honor to be at your family service. Clemente is one of the best tour guides I have ever met. He is intelligent, articulate, knowledgeable, experienced, humorous and kind. In 9 hours, he showed us everything on the tour and more, including a Panamanian lunch. He gave us an historical and modern day perpective of Panama based on his own rich personal and professional history. He often cited references with his comments. The tour was very educational, informative and fun, and we would strongly recommend Clemente and Tours by Locals. Linda L.
TOUR GUIDE RESPONSE: Gracias Linda, it was my honor and pleasure to be at your service. My wife, 2 friends and I did the Panama City Tour. Our pickup was a little off the beaten track in Coronado,but I emailed Clemente directions. His arrival was timely. Clemente is friendly, has good English skills and willing to adapt tour to our requests ( lunch at a typical Panamanian restaurant). Tour was as described on the website. All of our questions were answered and we had an enjoyable & informative day. We would highly recommend Clemente for your Panama City tour. TOUR GUIDE RESPONSE: Very nice Canadian people,I enjoy your company during all of our 10 hours tour. Best regards. Clemente did a great job. He organized both a tour, lunch and an extra guest pick up downtown. He was very easy to deal with, very pleasant and the group had nothing but positive things to say. Gracias Clemente! TOUR GUIDE RESPONSE: Gracias a usted por la oportunidad. Clemente provided an excellent tour in a comfortable air-conditioned vehicle. He is knowledgeable, easy to talk to, and a good conversationalist. He made suggestions and was flexible, allowing us to change itinerary to experience the highlights of his country of which he is most proud. My wife and I spent a "long weekend" in Panama City. On our 1st day, we had Clemente's city tour. By seeing Panama through his eyes, we fully understood the country's dynamic recent history and exponential growth. He blended the old Panama with the new perfectly. And for the next two days, even though he was busy with other tours, he kept in contact to make certain the things we did on our own were rewarding. His English is perfect, and his personality is infections. Highly recommended. Clemente was a very personable and knowledgeable guide; his tour of Panama city was well thought out and he has an easy style with the way he puts things over to you - not like a pre-rehearsed speech some guides give you. He mad fit an altogether enjoyable and interesting day. TOUR GUIDE RESPONSE: It was my honor to be at your service. Thank for the oportunity! Clemente is most definitely a 5 Star guide. His knowledge of Panamanian history and ability to convey what he knew was one of the highlights of our visit. I would highly recommend him. Clemente is an excellent tour guide with excellent command of English. He is most knowledgeable about the Panama Canal. We felt, however, that he could have spent more time in the old section of the city, stopping to explain the different churches and important buildings.He just drove by everything very fast without even saying what they were. TOUR GUIDE RESPONSE: Sorry but you book the 6 hours 30 minutes Panama city tour, and you spent a lot more time than schedule in the places we visit previously (canal, Ancon Hill, etc. ), When we reach to the Old Town it was already more than 7 hours of tour, and yes I told you the name of places (who could you know it was the old town? ), if you would had ask to stop I woul had done so. This tour was excellent. Clemente is very knowledgeable and very personable. He made sure we saw the important parts of Panama. Clemente is a star! In all my travels, I've never had such an amazing guide. Charming, well spoken, a total font of knowledge on Panama City, Canal Zone, Colon, Portobello, the National Parks, historic forts, Casco Viejo, and much more. If you're looking for a joy ride and a gloss over, stop reading. But if you truly want to experience not only the beauty of Panama, but its history, geography, sociology, etc, so that Panama comes alive for you, Clemente is your man! Muchas gracias! You're the best! TOUR GUIDE RESPONSE: A million thanks! To do my best effort to meet your expectations and over, it is always my goal,the $$$...than finish. But these words will be in my heart for a long...time. Un millon de gracias!